It’s the end of the month which means it’s time for another TBT. This time I’m talking about Ace Attorney, a game I mention often. Though I don’t know if I’ve ever mentioned the first time I played. The Phoenix Wright: Ace Attorney trilogy was originally released for the Nintendo DS, though Kris and I had no idea the games existed. We were upstairs in our bedroom, long before we had an office/game room (our office is our older sister’s old bedroom that we transformed when she moved out). We wanted a new game to play and were scrolling through the games on the Wii shop channel. Yeah, the Wii U didn’t even exist yet. Anyway, we were scrolling and came across the Ace Attorney games. I love mystery and detective stuff and it seemed to intrigue Kris enough. We saw there were three games and downloaded Trials and Tribulations, not realizing the three were a trilogy and we just so happened to buy the final game. I remember playing the first case together. Then the second and third. Then the finale with Dahlia… if you’ve played, you know who I’m talking about. We played at night, in the dark, which was a mistake, but we enjoyed ourselves so much anyway. The cases were so intriguing and well thought out. The characters were amazing. The dialogue was witty and the animations were fun to look at. Once we finished that game and realized it was the third, we bought and downloaded the first two games immediately. We told our older sister about it, Lisa, and she was interested in it as well. Now, this was long after she stopped playing video games with us so Kris and I were excited we had found a game Lisa wanted to play with us. We moved the Wii down to the basement where the TV was bigger and there was more room to play. After school and work (and while our dad was still at work because the basement is his man cave), the three of us would go downstairs and play the game for as long as we could. We played through the whole trilogy together. It was awesome and so much fun. Of course, Lisa never played the rest of the games with us, such as Miles Edgeworth, Apollo Justice, or any of the handheld games. It was hard enough for Kris and I to stare at the small screen together and play the games. Lisa wasn’t interested in staring at a tiny screen and told us if the games ever came onto the shop channel again, she’d play with us. Of course, they never did. Lisa was never one for anime either because the animation always annoyed her. Still, maybe she’d be interested in watching the show with us sometime soon. Do you remember the first time you’ve played a game? Do you have certain fond memories of Ace Attorney or something else? Let me know in the comments below! This game is older than me! Our grandparents used to have a copy of the game at their house, with their SNES and our uncles’ other video games, and Street Fighter was one of those games that Rachel tended to pick up rather than me. I don’t know why, but I remember always playing this at my grandparents’ house. I always picked Chun Li to play and had such a great time. Maybe it was because I just enjoyed button mashing? Street Fighter is a fighting game (duh). Players pick a character, each with their own unique looks and fighting styles. Characters move left to right on the fighting stage and can duck or jump if the D-Pad’s down or up directional is pressed. The rest of the buttons enable the characters to kick or punch, with combos being possible. The gameplay really is as simple as it sounds. Of course, there are combos to be created, though Kris and I aren’t that good. We tend to just button mash and whoever manages to hit the other one first, wins. After every couple of matches, there were also these bonus stages to rack up more points, with the three being about destroying objects. The first was busting up a car, the second was a stack of bricks, and the third was going against rolling barrels, of all things. I dominated in the rolling barrels one since I kept hitting Kris instead! Still, the bonus stages were quick, easy, and totally random. It broke up the battles a little bit though. The graphics for the game aren’t too bad. The stages are simple enough with the backgrounds decorated to resemble the part of the world that the characters are fighting in. The movement of your characters is fairly well done, the graphics responding smoothly to the controls. The backgrounds are actually my favorite aspect of the game. They aren’t stiff, things are happening and moving in the background and it’s pretty cool. I especially loved India because the elephants cheered when someone was declared the winner. The music was fun as well, the tunes getting you pumped up for the fights. The music wasn’t overpowering, however, allowing you to focus on the fight without getting too distracted. Rachel and I did find ourselves bobbing along every once in a while, of course. I was bobbing along with the theme on the main menu of the game. I did enjoy the music, but I’ll admit I didn’t hear too much of it during the battles. I was too focused on battling and… well, I was shouting most of the time. Street Fighter is one of those games that you may pick up once in a while just for fun, with it being one of the simplest fighting games in the genre. It’s pure button-mashing at its finest, with the rounds being quick enough to play a few matches during some downtime. It was certainly a great game to get back to. I’m not sure if I’ll pick it back up again anytime soon, but it’ll be something quick and fun when I need something mindless. 3 out of 5 lives. Our Favorite Ace Attorney Is Coming Back! 2017 has been a great year for gaming, especially fans of Nintendo and the Switch. And I just found out that it’s only going to get better. According to Kotaku UK, Pheonix Wright will be making a comeback in 2018! Capcom has confirmed that there will be three new Ace Attorney games coming out next year. Two may come between April 2018 and October 2018. Those two games will be compilations of previous Ace Attorney games. The first one being the first three games and the other being games four through six. Of course, the first Ace Attorney trilogy is on the Nintendo 3DS, but these games will now be coming to the Nintendo Switch. When Kris and I first discovered this series, we bought Trials and Tribulations (the third and final game of the first main trilogy… not realizing it was a trilogy). It was through the Wii Ware and we bought and played through all three games. Then they kept coming out on the Nintendo DS and Nintendo 3DS between Miles Edgeworth and Apollo Justice. We kept buying and playing them. I don’t know if we’ll get these games for the Switch, but it will be nice to play them on the big screen again. I’m eager to see how the Switch will make the games appear. The best part of this news, however, is that the third game will be brand new. It’s going to be another Phoenix Wright game with Phoenix as the main playable protagonist and five brand new cases to start off with. It’s going to be the beginning of a new mainline Ace Attorney game… which, I assume (hope) that means there will be more new games to come after this one. Maybe this will be another trilogy? I hope so. I was worried after playing through Spirit of Justice only because they brought a lot of old characters back and wrapped up a few loose ends. While they didn’t tie every knot, it really did seem as though it may be the last game. I’m glad that won’t be the case. I love my Pokemon, Mario, and Zelda, but I am super excited that Phoenix will be making his way to the Nintendo Switch! I can’t wait to play as him again. I can only imagine what new adventures (and troubles) he’ll get into this time. Are you excited about this new game? Let me know in the comments below! I know a lot of people are talking about the latest Monster Hunter game… Monster Hunter Stories. I know nothing about this game or Monster Hunter in general, so let’s talk about it. Monster Hunter is a game that I’ve always wanted to try out and play. However, other games always catch my attention. Therefore, Monster Hunter hasn’t been a huge priority for me. Still, it’s in the back of my mind and definitely a series I want to try out. But… where do I start? I think it looks pretty good though. In a way, it reminds me of Pokemon. You grab an egg, hatch it, and then it joins your team. Judging by the trailer, I think this game looks promising. The graphics are very well done and the music is good too. The game itself looks fun to play. I feel like I want to give it a try, but then I have no idea what I’m doing. I feel like I should play some of the main games before this one. What do you guys think? Where should I start? Which Monster Hunter is your favorite? Have you tried Monster Hunter Stories yet? What do you think of it? Let me know in the comments below and we’ll chat! Happy Friday, everyone! Another month has come and gone, and we’re getting closer to the second half of 2017. Anyone else feel like time is going by too fast? Considering the rumors of a Mini SNES being produced by Nintendo, I thought we’d talk about another SNES game, one that certainly was popular enough back in the day to make the Mini SNES list — Street Fighter II: The World Warrior. Street Fighter II: The World Warrior is a fighting game that was originally released in 1991 as an arcade game before being ported to Nintendo’s SNES system. It became one of the best sellers of that console. It’s the sequel to the original Street Fighter from 1987. The series was developed by Capcom, and Street Fighter II was the company’s best-selling game all the way up until 2013, when Resident Evil 5 surpassed it. That’s over two decades! Street Fighter II is credited with starting the fighting genre in home console video games. The player would select a character from a roster to compete in a one-vs-one fight, usually in a best two out of three rounds of close combat. Each character has a health bar and the aim is to deplete the opponent’s health bar before the timer runs out. Once the timer runs out, the player with the most health would win the round. The game’s character roster boasted a diverse range of characters with their nationalities. Each had his or her own fighting style and it was a challenge to master everyone’s abilities. The fights even took place in stages from the characters’ home countries. What I remember most about this game is Rachel playing it all the time at our grandparents’ house when her age was still able to be counted on one hand. If I wasn’t playing with her, I was probably waiting for her to be done so I could play Super Mario RPG. Have you ever played Street Fighter II? What did you think of it? With all this talk about the Nintendo Switch and Breath of the Wild and everything, I thought now would be a good time to talk about a character from the Ace Attorney series. Seems now is as good a time as any, right? Miles Edgeworth is the chief prosecutor in the Ace Attorney games. He first appeared in Phoenix Wright: Ace Attorney (2001) and has been in most Phoenix Wright games, the latest being Ace Attorney: Spirit of Justice (2016). He has also had his own game, Miles Edgeworth: Investigations (2009), which held a sequel that only came out in Japan. I think Edgeworth is one of the best characters in the Ace Attorney series. He develops so much from the very beginning and even though Phoenix is his rival, they’re good friends. I love how the creators of this game made it so that Edgeworth wasn’t a “bad guy” simply because he’s the protagonist’s rival. Miles is the kind of guy I would want to get to know in real life and definitely someone I’d want on my side. 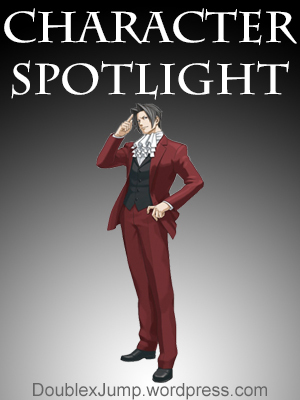 What do you think of Miles Edgeworth? Let me know in the comments below! I’ve seen many a play-through on YouTube of games. And most often than not, they never save their game for fear of the footage getting corrupted. They want to be able to go back and try it again. I’m here to say that I don’t know how people can do that. When I play a game, I can’t begin to count how many times I save, if I can. It always bothers me when a game only allows you save at certain points in the game. Then again, if I can save whenever I want, I abuse that power. Take Paper Mario, for example. You only come across save blocks in certain parts of the game. Because you can’t save that often, every time I see one, I immediately stop what I’m doing and go hit that block. I’ll save, then go into the Toad House to heal, maybe buy a few items, and then save again. Because I’m that paranoid. Then you’ve got Pokemon. I can save whenever I want, but I’m not really in any “dire” situations through most of the game. However, I’d be lying if I didn’t save right before a gym battle. Or, sometimes, right before a wild Pokemon encounter. Then you’ve got a game like Ace Attorney. Kris and I are working our way through Spirit of Justice, and the other night I can’t begin to explain how many times we saved. We were both tired, and I’ll admit that neither one of us was doing well at solving anything the game threw at us. Because of that, we were unsure of every move we made. So we saved the game probably every 2-3 minutes. Even on a good day, when we’re sure of ourselves, we still save right before answering because we’re afraid we’re going to get a penalty. We have five chances, but we like to be perfect… Edgeworth taught us that way back when. Do you constantly save as I do? Or do you like to live dangerously and chance it? Let me know in the comments below!